The district of San Casciano Val di Pesa is located in the Chianti area and extends over a hilly rich in vineyards, olive groves and cypress trees, crossed by the Via Cassia (SS 2). The San Casciano is renowned for the production of wines and olive oil. The main wine cellars of the famous Antinori company is just located in the municipality. The rest of the economy is based primarily on craft and tourism, in particular farm. The castle was built by Cadolingi of Montecascioli in the tenth century with the name of Castrum Bibionis. It is placed in a dominant position on the Pesa river valley and is a massive rectangular construction on whose facades are the different stages of construction can be observed. In the 15th century military buildings were gradually dismantled and the castle became manor house. Despite this, the wall is still visible. The castle is also provided with an underground passage which extends for hundreds of meters up to the plain below. This secret passage has been explored only in its first section. Currently, Bibbione’s residence under the protection of the Superintendence of Environmental and Architectural Heritage of Florence and properties of the Rangoni Machiavelli family, but can be visited. The castle belonged to a branch of the Bardi family from the beginning of the 15th century. In the19th century it was owned by the Rosselli Del Turco family to whom we owe the construction of a neoclassical chapel. Later it passed to the Lemmi family and was widely altered by them. In the 20th century it became the property of the writer Arnaldo La Cagnina, then of the Arcaini family and today is home to a winery owned by the Beringer Blass family. Externally the castle looks like a quadrangular block with four cylindrical towers placed at the corners. Besides fulfilling a defensive function they constitute an aesthetic element of considerable effect. The castle is currently a stately home. It was built in the 11th century. Once again cited as an ammunition depot in March 1480, it finally lost all military role. Located outside the town of Montefiridolfi, it is reached by a small avenue of cypresses. It looks like a massive construction with opposed corners. The castle, with a trapezoidal plan, contains two courtyards, in addition to that of the parish rectory, each equipped with an artesian well (which gave rise to an old folk nursery rhyme with a legend: “Monte montoro, within three wells a calf of gold “). Currently the castle-farm belongs to the Rosselli Del Turco family. Dating back to the 13th century, the castle was owned by the Canigiani family. This fortress has been the object, over the centuries, of a series of incursions to which it has always resisted. At the end of the seventeenth century it was given to the Miniati barons, who transformed it into a villa enriching it with works of art. The current architectural forms are the result of the restoration of 1910 by the architect Giuseppe Castellucci, who practically reinvented the castle in the neo-medieval style. With the restructuring new impetus was also given to the large farm, were built new premises for the farm including the mill, cellars and warehouses where it is still vinified with traditional methods. Visitable by reservation. In the church, dating from the 10th century, he lived a community of canons. In the 15th century the church was extensively remodeled and the beginning of the 20th century, underwent another significant intervention. Original Romanesque structure remain only the bell tower and the grandstand where there are three apses of which only the central one appears still intact and fully visible. The bell tower is made of sandstone and limestone and presents no opening up to the bell cell, the latter realized in a later period. The interior is located at a lower level of the ground surface and is divided into three naves by five spans resting on four pillars with a rectangular section. On the right wall there is a fresco of the early 16th century depicting Madonna between San Sebastian and San Rocco. At the altar a painting by Francesco Cenni with Madonna del Latte (dated 1400) inserted along with a 16th Nativity in a table of school of Santi di Tito representing Santa Cecilia and San Pancrazio. The main altar, made of polychrome marble in the 18th century, is a wooden crucifix of the 16th century. In the left aisle there is the Crucifixion Santi di Tito (1590). The church, dating from the 10th century, was a direct possession of the Florentine bishops here had a feudal lordship. In 1751 it was built the oratory. As a result of the damage suffered in the earthquake of 1895 the church was restored again. The church has preserved its original spatial organization consists of three aisles of six bays each divided by rectangular pillars. The facade is characterized by pilasters that end in a pronounced crowning of the cusp, five blind arches resting on concave shelves. The interior was raised and adapted to the Baroque style in the 18th century. The monastery of Santissima Annunziata, commonly referred to as Luogo Nuovo dates back to 1360. At the end of the inside 20 th century was converted into private apartments. The monastic complex consists of two distinct areas: the church and former monastic premises, both characterized by an architectural style of transition between Romanesque and Gothic. The rooms once reserved for monks are no longer accessible as they are transformed into apartments. The church has a Gothic appearance constituted by a single large structure nave ended with a quadrangular scarsella. Inside, covered with wooden trusses and fully plastered and decorated in monochrome, there were three chapels which houses the tomb Ark white marble, decorated with coats of arms Buondelmonti, the founder and his wife. It was built as the top of the walls in the shape of irregular hexagon, to be used as a refuge in case of emergency as well as the headquarters of the militia or private residence. In 1354 the mercenary leader Fra Moriale occupied the village and stayed there until they were paid for 16,000 florins. Immediately after the Republic of Florence decided to fortify the entire village. The walls, seven meters high, measured in 2135 Florentine arms length (equal to 1,240 meters) and had four doors. The formwork hosted important figures such as various members of the Medici family, including Lorenzo the Magnificent here granted to the inhabitants of Colle Val d’Elsa Florentine citizenship. Then even the Grand Duke Cosimo Medici. In the 16th century the keep was given to Francesco Giovanni Paulosanti Lucardesi, secretary of the Grand Duke, who in turn gave it to the monastery of Santa Maria di Gesu. It remained the property of the monastery until the Napoleonic era when it was sold to private households and used as home. The mold is a rectangular building dominated by a massive tower. Inside are large rooms, one of which was used as a city theater. The walls still present and the best preserved side is along the Market Square which also has a work by Mario Merz. House Machiavelli, also known as Albergaccio, was the home of Niccolò Machiavelli (1469-1527) during his exile from 1512. The house belonged, along with several farms, families the writer who composed his most famous book, Prince. The farm, with its adjacent Albergaccio tavern, is described in one of his most famous letters, one addressed to his friend Francesco Vettori in 1513. In the letter Machiavelli describes his days spent in the home management and evenings spent at tavern to play with the landlord and a local butcher. Currently the property belongs to the Italian Wine Group. You can visit the rooms of the villa, the beautiful cellars and, through an underground passage, entering the inn described by Machiavelli. This too has preserved the original architecture. The building dates back to the early fifteenth century when it is owned by Dianora di Biagio del Milanese. At the time the villa-castle consisted of a stately home and another for the workers and surrounded by a land that produced wheat, barley, flax, two barrels of red wine, a jar of oil a year and also 200 pounds of pork. At the beginning of the 16th century it was bought by the widow of Filippo Strozzi. The possession of the Strozzi was very long (three centuries) and the villa followed the various inheritance successions. In these three centuries the Strozzi greatly expanded the property by purchasing various land in the surroundings with the aim of getting them together. At the beginning of the nineteenth century the farm consisted of 20 farms managed by the sharecropping system and another three data for rent, for a total area of ​​400 hectares. The Strozzi remained owners until 1911 when it was bought by the Frova counts, still owners. 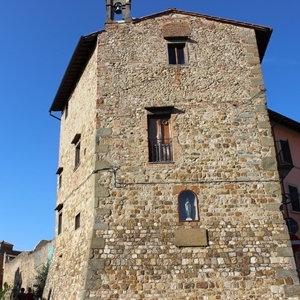 The whole complex is built around a square-based tower on which the Strozzi coat of arms is located. The tower is what remains of the stately home. Major restoration work was carried out after the earthquake struck the area in 1812. In 1818 Lorenzo del Moro realized the clock placed in the tower which presents a crenellation resulting from an evident neo-Gothic style remake. On the ceiling of the chapel inside the villa there are paintings by Attilio Ravaglia, guest during the Second World War. Le Corti is a Renaissance villa built at the beginning of the seventeenth century by architect Santi di Tito and became a national monument, although owned by the Corsini family, one of the oldest Italian aristocratic families. A rectangular plan, the villa shows two massive towers at the corners of the northern front. Inside there is a quadrangular courtyard consisting of a loggia with round arches with cross vaults. Inside it should be mentioned the Sala delle Donne (dining room), so named because at the end of the nineteenth century it was decorated by the painter Gaetano Bianchi with the coats of arms of the noble houses of the women who went to the Corsini: under each coat of arms there is a portrait of the respective husband. Then the Hall of the Titles (former game room) where the vaults are decorated with the main businesses of the Corsini family members. Next is the Clement Hall XII (ballroom) where there is an impressive marble bust in memory of the pontiff and the Salone a Tramontana which houses a beautiful fireplace in pietra serena. On the first floor the loggia was walled on three sides to allow the construction of a gallery that houses the portraits of the most authoritative members of the Corsini family. On the first floor there is also the family archive, 1,200 linear meters of registers, cards and parchments through which the history of the family unfolds. The rooms on the upper floor are private and therefore not open to visitors. In this part of the villa there is the family chapel, consisting of a single rectangular hall with a barrel vault and walls covered with a blue silk fabric with golden damasks and polychrome embroidery. The frescoes were made by Bernardino Poccetti and Francesco di Alessandro Leoncini. There are also ample cellars, organized on three underground levels, where the farm’s products are kept: Chianti Classico wine and extra virgin olive oil. The gardens around are made up of geometric Italian flower beds, a large park with an avenue bordered by centuries-old cypress trees, and a lawn around the villa. Inside the park there is a frescoed tabernacle dating back to the 14century and a statue of Giambologna. The agricultural property extends for about 250 hectares in the heart of the Chianti Classico area. Twice a year the property organizes two significant events: in May at the Corti del Vino, a fair with eno-gastronomic tastings, and, in September, Giardini in Fiera, an exhibition-market of gardening and horticulture. The villa, built at the end of the XIVth century by the Bondi family, was one of the most loved by the illustrious Florentine family, who enlarged it and made it the center of its agricultural estates (especially wineries). Externally the villa is surrounded by a curtain wall in which opens a door with a sandstone frame. The building has a rectangular base plant with a rear garden façade and a large bathtub. Inside the villa reflects the 16th century characters. One example is the main hall, which is sometimes clad and is decorated with a large fireplace. On the main courtyard there is a loggia with three round arches, today closed with windows. On the wall of the loggia there are two glazed terracotta tondi, attributed to Giovanni della Robbia, depicting the coats of arms of the Antinori and Tornabuoni families surrounded by festoons of fruit. The large cellars date back to 1898. The walled garden, one of the most beautiful in the Val di Pesa, allows a panoramic view of the valley below. At the center dominates the large water nursery, built in 1690. The construction of the nymphaeum dates back to the 18th century, on the initiative of Vincenzo Antinori, who also built the large lemon house and the loggia below, with a mask and other decorations in spongy stones. Among the plants in the walled garden stand out two large cedars of Lebanon, laurel beds and numerous floral plants. Around the villa there is an English park, with pines, holm oaks, chestnut trees arranged in rows and a scenic avenue of cypresses, which leads, a short distance, to the chapel. The building, now owned by the University of Florence, belonged to famous Florentine families such as the Acciaioli, the Medici and, from the mid-seventeenth century, the Corsini. It covers an area of ​​over 320 hectares, consisting of vineyards, olive groves, arable land and woods that frame the Medici building, located on the ridge of the hill sloping down towards the river Pesa. The villa, a classic example of Renaissance construction, is enriched by a garden that recalls the medieval typology of the hortus conclusus and dominates the small rural settlement that includes some annexes, the farm, other buildings and a church. There are courses and educational activities with the application of experimental techniques of viticulture, oenology and landscaping and hydraulic-agrarian arrangements. There is also an oil research laboratory. It is the Torre dell’Acqua, later named Torre del Chianti, which has become above all a panoramic terrace from which it is possible to enjoy an excellent view of the Chianti hills. The ancient piezometric tower has a striking cylindrical shape and, from its 33 meters, dominates the surrounding landscape. The tower houses the contemporary art work “BULK”, the result of the collaboration between the artist Patrizio Travagli and the group of architects WOKdesign. It is also home to exhibitions and cultural events. This is the renovation of an ancient building that has been known since the ninth century and where an astronomical telescope was installed. At the top of the tower, the roof opens into a large window to allow you to peer into the sky. The Observatory organizes, usually when the moon is in the first quarter, observing evenings, some public and others reserved for amateur astronomers. The Museum is located inside the church and the convent of Santa Maria del Gesù. It exhibits archaeological finds and works of sacred art from the territory of San Casciano. From the entrance hall, dominated by the majestic stele known as the “dell’Arciere”, the museum itinerary starts from the sacristy where the sculpted trunk of the Master of Cabestany is kept, among other works. From here you enter the church, dating back to the second half of the 15th century and built by the Franciscan friars of the Osservanza as a place of hospitality. From the sacristy, the path continues in the hall of paintings and in the section of sacred vestments. There are two cornerstones of Florentine and Sienese painting of the thirteenth and sixteenth centuries: the Dossal of St. Michael the Archangel of Coppo di Marcovaldo and the Madonna with child by Ambrogio Lorenzetti. In addition to these works, the museum contains paintings by Neri di Bicci, Iacopo del Casentino, the Master of the Horne Triptych, the Master of San Lucchese and others. The first floor houses the archaeological section and that of primitive dwellings that also continues on the second floor. La tomba etrusca è costituita da una sola camera perfettamente quadrata che misura 5.30 metri di lato. Il dromos, il pavimento e le pareti della tomba sono costituiti da pietre di alberese provenienti dalle vicine colline di Campoli (circa 20 chilometri di distanza). La grandezza di tali pietre e quindi il loro peso (fino a 80 quintali) è impressionante e destano meraviglia le tecniche di trasporto e di costruzione degli etruschi già nel periodo arcaico. Sono stati ritrovati frammenti di ceramica, di avorio, di bronzo ed una piccola fibula d’oro. Oltre alle pietre di copertura, durante lo scavo venne alla luce anche una stele raffigurante una figura maschile armata di arco, probabilmente un cacciatore o un guerriero, esposta nel Museo di San Casciano. 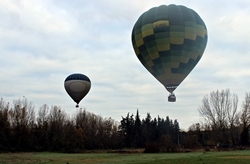 Services: hot air balloon flight and toast with prosecco, private flights for 2 persons and groups, Chianti area, Siena and Lucca; expert pilots. San Casciano has also linked the name to important figures and works of contemporary art. THE DEER OF MARIO MERZ: placed in the upper part of the village walls is a progression of neon numbers, each of them obtained with the sum of the two previous ones, which refer to the Fibonacci mathematical sequence to indicate the proliferation of biological life and of the natural world. THE SCULPTURES OF MAURO STACCIOLI: the first is located in the center of the roundabout at the northern entrance of the town, the second, in a clearing overlooking a wonderful Chianti landscape near the Torre di Luciana. TUSCIA ELECTA: is a contemporary art exhibition, also promoted by the Municipality of San Casciano, focused on a possible model of redefinition of the landscape and the urban fabric through the inclusion of contemporary works in the Chianti area, between the cities of Florence and Siena. Already inhabited in Etruscan times, the territory of San Casciano owes its fortune to the Roman road that connected the colonies of Florentia (the current Florence) and Sena Julia (Siena). 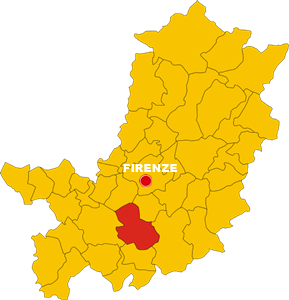 The town was located at the tenth mile from Florentia. In the Middle Ages numerous caste were built, subjugated to the Florentine episcopate or to powerful families, such as the Gherardini, the Buondelmonti and the Cavalcanti. In the twelfth century the house was a fief of the Florentine bishops, who in 1241 granted the first civil statutes. Shortly after it became the capital of a Podesteria including the League of Campoli, for a total of over forty “peoples”. The importance achieved by the town is such that, in the Statute of the Podestà of the City of Florence (1325), one of the main roads that branch off from the city gigliada is called “road to San Casciano”. Unfortunately in the first half of the XIVth century, San Casciano was occupied first by the emperor Arrigo VII (1312), then by Castruccio Castracani who, in February 1326, sacked the village and burned it. Precisely as a result of these facts, the Republic of Florence decided to fortify the village with walls and a keep, in part still existing. In 1512 at the Albergaccio (locality Sant’Andrea in Percussina) the exile of Niccolò Machiavelli began. 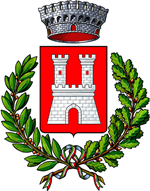 In 1880, after the unification of Italy, San Casciano became a municipality. Amici miei: the scene where the swag with the money is thrown into the river was turned on Via Scopeti, at the same height as the Scopeti bridge; the next scene, where the group opens the tabernacle to take the swag with the money, was shot on the bridge of Cappello, in Via di Luiano. Amici Miei Act II: the scene where the protagonists stop to bring down the loan shark Sabino Capogreco (Paolo Stoppa) to carry out their needs was turned on the SP92, at Villa Le Corti. In the early 80s of the last century San Casciano was at the center of national and international news for the events related to the murders of the so-called “Monster of Florence”. A serial killer was the author of a series of eight double murders in the area. The crimes of the Monster of Florence developed over almost 20 years. The victims were all young couples who belonged to the countryside in search of intimacy. The area of San Casciano is renowned for the production of Chianti wines and olive oil. The main cellars of the famous Antinori winery are planted in the municipality of San Casciano. The Wine Roads are itineraries within the Tuscany region with high wine production and characterized by important cultural, historical and naturalistic attractions. The Wine Roads allow you to visit cellars and famous wineries among unspoiled landscapes and medieval villages that still retain the traces of the original architecture. The Chianti Classico Wine and Olive Oil Road is superimposed on the Chiantigiana road that runs through the entire production area. The first stop is Greve in Chianti, with the characteristic “piazza mercatale”. The road then continues to Panzano in Chianti, Castellina in Chianti, Fonterutoli and finally to the city of Siena. Much of the route is crossed by other roads that link to villages and castles, such as Radda in Chianti and the Castello di Brolio, where Bettino Ricasoli formulated the Chianti wine “recipe”. Along the way you can take guided tours of the cellars and tastings of wines, oil and cured meats; in the restaurants and taverns you can taste the specialties of the Chianti cuisine.